Everyone with sickle cell disease shares the same gene mutation. A thymine replaces an adenine in the DNA encoding the ß-globin gene. Consequently, the amino acid valine replaces glutamic acid at the sixth position in the ß-globin protein product (Ingram, 1956). The change produces a phenotypically recessive characteristic. Most commonly sickle cell disease reflects the inheritance of two mutant alleles, one from each parent. The final product of this mutation, hemoglobin S (HbS), is a protein whose quaternary structure is a tetramer made up of two normal alpha-polypeptide chains and two aberrant ßs-polypeptide chains. The primary pathological process leading ultimately to sickle shaped red blood cells involves this molecule. After deoxygenation of hemoglobin S molecules, long helical polymers of HbS form through hydrophobic interactions between the ßs-6 valine of one tetramer and the ß-85 phenylalanine and ß-88 leucine of an adjacent tetramer (Schechter, 1978). Deformed, sickled red cells can occlude the microvascular circulation, producing vascular damage, organ infarcts, painful crises and other such symptoms associated with sickle cell disease. Although everyone with sickle cell disease shares a specific, invariant genotypic mutation, the clinical variability in the pattern and severity of disease manifestations is astounding. In other genetic disorders such as cystic fibrosis, phenotypic variability between patients can be traced genotypic variability (Powars and Hiti, 1993). Such is not the case, however, with sickle cell disease. Physicians and researchers have sought explanations of the variability associated with the clinical expression of this disease. The most likely causes of this inconstancy are disease modifying factors. I have reviewed the role of some of these factors, and tried to ascertain the clinical importance of each. Augmented post-natal expression of fetal hemoglobin (HbF) is perhaps the most widely recognized modulator of sickle cell disease severity. Fetal hemoglobin, as its name implies is the primary hemoglobin present in the fetus from mid to late gestation (Higgs et al, 1989). The protein is composed of two alpha-subunits and two gamma-subunits. The gamma-subunit is a protein product of the ß-gene cluster. Duplicate genes duplicate upstream of the ß-globin gene encode fetal globin (Higgs et al, 1989). Fetal hemoglobin binds oxygen more tightly than does adult hemoglobin A. The characteristic allows the developing fetus to extract oxygen from the mother's blood supply (Powars and Hiti, 1993). After birth, this trait is no longer necessary and the production of the gamma-subunit decreases as the production of the ß-globin subunit increases. The ß-globin subunit replaces the gamma-globin subunit in the hemoglobin tetramer so that eventually adult hemoglobin, HbA, replaces fetal hemoglobin as the primary component red cells. HbF levels stabilize during the first year of life at less than 1% of the total hemoglobin. In cases of hereditary persistence of fetal hemoglobin, that percentage is much higher. This persistence substantially ameliorates sickle cell disease severity (Personal Communication, Dr. Ken Bridges, April 1996). Two properties of fetal hemoglobin help moderate the severity of sickle cell disease. First, HbF molecules do not participate in the polymerization that occurs between molecules of deoxyHbS (Goldberg, et al., 1978). The gamma-chain lacks the valine at the sixth residue to interact hydrophobically with HbS molecules. HbF has other sequence differences from HbS that impede polymerization of deoxyHbS. Second, higher concentrations of HbF in a cell infer lower concentrations of HbS (Bailey et al, 1991). Polymer formation depends exponentially on the concentration of deoxyHbS (Eaton and Hofrichter, 1995). Each of these effects reduces the number of irreversibly sickle cells (ISC). The level of HbF needed to benefit people with sickle cell disease is a key question to which different studies supply varying answers. Bailey et al. (1991) examined the correlation between early manifestation of sickle cell disease and fetal hemoglobin level in Jamaicans. They concluded that moderate to high levels of fetal hemoglobin (5.4-9.7% to 39.8%) reduced the risk for early onset of dactylics, painful crises, acute chest syndrome, and acute splenic sequestration. Platt et al. (1994) examined predictive factors for life expectancy and risk factors for early death (among Black Americans). In their study, a high level of fetal hemoglobin (>8.6%) augured improved survival. Koshy et al. (1989) reported that fetal hemoglobin levels above 10% were associated with fewer chronic leg ulcers in American children with sickle cell disease. Other studies, however, suggest that protection from the ravages of sickle cell diesease occurs only with higher levels of HbF. In a comparison of data from Saudi Arabs and information from Jamaicans and Black Americans, Perrine et al. (1978) found that serious complications (i.e. jaundice, splenectomy, hematuria) occurred only 6% to 25% as frequently in Saudi Arabs as North American Blacks. In addition mortality under the age of 15 was 10% as great among Saudi Arabs. Further, these patients experienced no leg ulcers, reticulocyte counts were lower and hemoglobin levels were higher on average. The average a fetal hemoglobin level in the Saudi patients ranged between 22-26.8%. This is more than twice that reported in studies mentioned above. Kar et al. (1986) compared patients from Orissa State, India to Jamaican patients with sickle cell. These patients also had a more benign course when compared with Jamaican patients. The reported protective level of fetal hemoglobin in this study was on average 16.64%, with a range of 4.6% to 31.5%. Interestingly, ß-globin locus haplotype analysis shows that the Saudi HbS gene and that in India have a common origin (see below). These studies suggest that the level of fetal hemoglobin that protects against the complications of sickle cell disease depends strongly on the population group in question. Among North American blacks, fetal hemoglobin levels in the 10% range ameliorate disease severity. The higher average level of fetal hemoglobin could contribute to the generally less severe disease in Indians and Arabs. Fetal hemoglobin levels have correlated with specific clinical complications of sickle cell disease in several studies. Emond et al. (1980) examined fetal hemoglobin levels, priapism and consequent impotence. Priapism is a prolonged painful erection. The problem develops when sickled cells obstruct the drainage of blood from the corpora cavernosa. Emond et al (1980) characterized two types of priapism. Stuttering episodes of priapism occured in 59% of patients studied while major episodes affected 38%. Stuttering priapism was characterized by multiple attacks of less than three hours duration occuring in bursts two to three times per week for several months. Major episodes were manifested by a single severe attack exceeding 24 hours duration and most often requiring hospitalization. In 10% of the patients, major episodes of priapism produced complete impotence. Of the patients afflicted by stuttering priapism, 28% subsequently suffered a major attack. The investigators found that patients with less severe stuttering attack also had higher levels of fetal hemoglobin than did those who suffered major attacks. While this study provides some information useful for treatment and prevention, important pieces of information are absent. Although a table provided hematological indices for the overall patient population, specific information on the group with priapism was lacking. While the sample size of 61 young men who suffered from attacks of priapism was reasonable, the study was based on a questionnaire. All data are retrospective. As with all retrospective analyzes, the completeness of the information is unknown. Also, no way exists to ascertain whether observational bias occurred in the initial recording of the data. The results of Koshy et al (1989), on the other hand can be accepted greater assurance. Data on patients were collected prospectively. Consequently, patients were observed under study conditions (e.g. patients were at steady-state at the time of blood collection; patients were regularly monitored). Unfortunately, this study failed to include patients with sickle cell disease who had not suffered from leg ulcers. Several studies showed little or no correlation between fetal hemoglobin levels and certain aspects of severity. Seltzer et al. (1992) reported on five black families with abnormally high levels of fetal hemoglobin (19-45% HbF). Of the eight patients observed in this study, two suffered from moderately severe disease. These two patients had HbF levels of 25% and 31%. Two other patients had HbF levels of 19%. One of these patients had mild disease while the other suffered from severe symptoms. The investigators attributed the variability to uneven distribution of fetal hemoglobin in erythrocytes (mature red blood cells). Other observations generally supported this line of reasoning. Patients who were asymptomatic or virtually asymptomatic patients had HbF in most of their erythrocytes. In contrast, the patients with markedly uneven distributions of HbF tended to be more symptomatic. The mean level of fetal hemoglobin in the circulation is important. However, the distribution of fetal hemoglobin between the cells is also significant. Heterogeneity of HbF distribution means that some cells will have none of the protective fetal hemoglobin. These cells would be prone to sickling, and could occlude the microcirculation, blocking the flow of cells that normally might have made it across the circulatory narrows. Such a "logjam" would nullify the anti-sickling effect of HbF in the other red cells. However, even accounting for heterogeneous HbF distribution, not all of the clinical heteroneniety could be explained. For instance, one moderately symptomatic patient had HbF value of 25% and a F cell percentage of 79% (namely, 79% of his red cells contained some fetal hemoglobin). Another patient with mild symptoms had a fetal hemoglobin level of 19% and an F cell percentage of 17%. More than 80% of the patient's cells lacked fetal hemoglobin, despite a high mean fetal hemogloin level. Seltzer et al. concluded that F-cell percentages and fetal hemoglobin levels, while important, are not the only variables that affect disease severity. Acquaye et al. (1984) studied two groups of patients in western Saudi Arabia totaling seventy-one individuals. One group had HbF levels above 10% and was designated SSHF. The other group had levels of HbF below 10%, and was designated SSLF. Many patients of both groups suffered clinically severe sickle cell disease, including urinary and respiratory tract infections, bone pain or infarcts and severe anemia. Some even had rare complications such as retinal hemorrhages, epistaxis, hepatic crisis, acute chest syndrome, and thrombotic stroke. No significant difference existed in several "severity factors" in these two groups. These factors included, hemoglobin levels, red cell count, mean cell volume, mean cell hemoglobin, reticulocyte count, and serum bilirubin levels. The only clinically significant difference between the two groups was a higher tendency toward infections and more frequent hepatomegaly in SSLF patients. Like Seltzer et al., these investigators concluded that additional factors to fetal hemoglobin levels modulate the severity of sickle cell disease. Another study that suggests only a small role at best for fetal hemoglobin as a modifier of sickle cell disease severity was reported by El-Hazmi (1992). The subjects were Saudi Arabs in whom a variety of symptoms associated with sickle cell disease were assessed to form a "severity" index. The author concluded that among his patients , no correlation existed between HbF and the severity index. However, his analysis has a fundamental flaw. El-Hazmi failed to examine the effect of HbF on each of these symptoms individually. There important information and an association between fetal hemoglobin levels specific disease manifestations could be concealed in his data. However, the study reinforces the conclusion that fetal hemoglobin levels most likely work in conjunction with other moderating factors to determine clinical severity in patients with sickle cell disease. Concurrent alpha-thalassemia has also been examined as a modifier of sickle cell disease severity. Alpha-thalassemia, like sickle cell disease, is a genetically inherited condition. The loss of one or more of the four genes encoding the alpha globin chain (two each on chromosome 16) produces alpha-thalassemia. A gene deletion most commonly is at fault. The deletion results from unequal crossover between adjacent alpha-globin genes during the prophase I of meiosis I. Such a crossover leaves one gamete with one alpha-gene and the other gamete with three alpha genes (Bunn, 1986). Upon fertilization the zygote can have 2, 3, 4, or 5 alpha genes depending on the make up of the other parental gamete. In people of African descent, the most common haploid gamete of this type is alpha-thal-2 in which there is one deletion on each of the number 16 chromosomes in the patient (Bunn, 1986). Heterozygotes for this allele, therefore, have three alpha genes (one alpha gene on one of the number 16 chromosomes, two alpha genes on the other). Embury et al. (1984) examined the effect of concurrent alpha-thalassemia and sickle cell disease. Based on prior studies, they proposed that alpha-thalassemia reduces intraerythrocyte HbS concentration, with a consequent reduction in polymerization of deoxyHbS and hemolysis. They investigated the effect of alpha gene number on properties of sickle erythrocytes important to the hemolytic and rheological consequences of sickle cell disease. Specifically they looked for correlations between the alpha gene number and irreversibly sickled cells, the fraction of red cells with a high hemoglobin concentration (dense cells), and red cells with reduced deformabilty. The investigators found a direct correlation between the number of alpha-globin genes and each of these indices. A primary effect of alpha-thalassemia was reduction in the fraction of red blood cells (RBCs) that attained a high hemoglobin concentration. These dense cells result from potassium loss due to acquired membrane leaks. The overall deformability of dense RBCs is substantially lower than normal. This property of alpha-thalassemia was confirmed by comparison of red cells in people with or without 2-gene deletion alpha-thalassemia (and no sickle cell genes). The cells in the nonthalassemic individuals were more dense than those from people with 2-gene deletion alpha-thalassemia. The difference in median red cell density produced by alpha-thalassemia was much greater in patients sickle cell disease. Reduction in overall hemoglobin concentration due to absent alpha genes is not the only mechanism by which alpha-thalassemia reduces the formation of dense and irreversibly sickled cells. In reviewing the available literature, Embry and Steinburg (1986) suggested that alpha-thalassemia moderates red cell damage by increasing cell membrane redundancy (morphologically seen as target cells). This protect against sickling-induced stretching of the cell membrane. Potassium leakage and cell dehydration would thereby be minimized. These two papers by Embury et al. give some insight into the moderation of sickle cell disease severity by alpha thalassemia. Some deficiencies exist, nonetheless. The first paper makes no mention of the patient pool. Unspecified are the number of patients used, their ethnicity, or their state of health when blood samples were taken.This information would help establish the statistical reliablility of the data, and its applicability across patient groups. Despite these limitation, the work provides important insight into the mechanisms by which alpha-thalassemia ameliorates sickle cell disease severity. Ballas et al. (1988) reached different conclusions regarding alpha thalassemia and sickle cell disease than did Embury et al . They reported that decreased red blood cell deformability was associated with reduced clinical severity of sickle cell disease. Patients with more highly deformabile red cells had more frequent crises. They also found that fewer dense cells and irreversible sickle cells correlated inversely with the severity of painful crises. Like Embury et al., Ballas and colleagues found alpha thalassemia was associated with fewer dense red cells. In addition, Ballas' group found that alpha thalassemia was associated with less severe hemolysis. However they reached no clear conclusion concerning alpha gene number and deformability of RBC except to note that the alpha thalassemia was associated with less red cell dehydration. The two studies are not completely at odds. Both state that concurrent alpha-thalassemia reduces hemolytic anemia. They agree that this occurs through reduction in the number of dense cells, a number directly related to the fraction of irreversibly sickled cells. Embury et al. conclude that through this mechanism red blood cell deformability is increased. The investigators diverge, however, on the relationship to clinical severity of dense cells and rigid cells. Ballas et al. assert that both the reduction of dense cells and rigid cells contribute to disease severity. They advance three possible mechanisms. The most interesting holds that the higher the deformability of cells, the greater their adherence to the endothelium lining the blood vessels. Red cell adhesion to endothelial cells is believed to contribute to vaso-occlusion by retarding erythrocytes in the microcirculation sufficiently long for sickling to occur there (Fabry, et al., 1992). Rigid erythrocytes may or may not enter microvasculature. If they do they are less likely to adhere to the endothelium and cause vaso-occlusion or compromise the blood flow. In contrast, deformable cells have a higher probability of entering the microvasculature, adhering to endothelium and causing vaso-occlusion. Ballas (1991) described a pair of patient groups with sickle cell disease in which the fetal hemoglobin level was less than 15%. The first group had a significantly fewer painful crises and more leg ulcers. However, the mortality in this group was 0%, while the second group had 33% mortality rate. The red cells of the first group were more rigid, and 22% were dense cells. The second group had fewer rigid red cells and about 10% dense cells. The reports of Ballas et al. (1988) and Emburyet al. (1982, 1984 and 1986) agree that concurrent alpha-thalassemia and sickle cell disease produces less severe hemolytic anemia through the action of alpha gene number on HbS concentration, HbS polymer formation, and the frequency of dense cells and ISC. The effect of alpha-thalassemia on other manifestations of sickle cell disease such as painful crises and vaso-occlusion are unresolved. The final potential modulator of sickle cell disease now known is haplotype. Of the three modulating factors discussed in this review, the role of sickle cell haplotype is least well characterized. The Senegal haplotype is represented most prominently in Senegal and in the most westerly regions of Africa above the Niger River. The Benin haplotype designates those found in Nigeria, Benin, and countries in the Bight of Benin. The Bantu or CAR haplotype encompasses those haplotypes discovered in the Central African Republic and countries in south central Africa. The Cameroon haplotype has been found in only one ethnic group in the Cameroons. 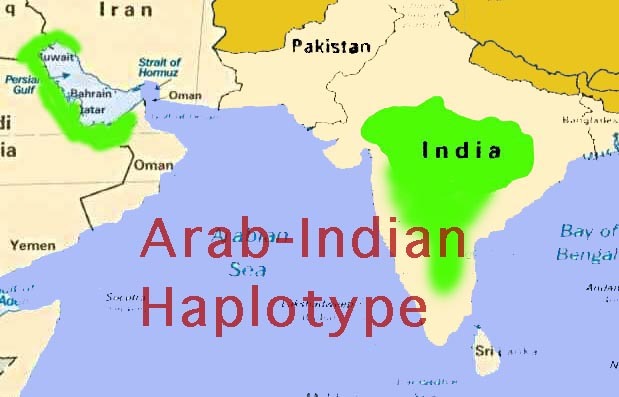 The Arabo-Indian haplotype usually refers to those haplotypes found in the Persian gulf and India. Sickle cell disease in India has been poorly investigated, relative to that in west Africa and the Middle East. Sickle cell disease is quite prevalent among tribal peoples in India. Unfortunately, the tribal peoples continue to have limited access to health care, in part due to their largely rural location. The existence of haplotypes specific to certain regions of the world suggests that the mutant ß-globin gene arose separately in these locations (Oner et al., 1992). All of the areas in question are now or have been endemic loactions of malarial infestation. This observation is consistent with the idea that the high incidence of the sickle mutation in these areas derived from natural selection (Carlson, et al.,1994). The mutation that produces sickle hemoglobin occurs spontaneously at a low rate. People with one sickle hemoglobin gene and one normal hemoglobin gene (sickle cell trait) are somewhat more resistant to malaria than people with two normal hemoglobin genes. People with sickle cell trait would have a better chance of surviving an outbreak of malaria and passing their genes (for sickle and normal hemoglobin) to the next generation when they have children. The independent origin of the sickle mutation opens the possibility that haplotypes could differ in associated sickle cell disease severity. The three most common haplotypes in the Americas are Senegal, Benin, and Bantu/CAR (Hattori et al., 1989)(Powars et al. 1994). In African populations, each is associated with different degrees of disease severity. People with the Senegal haplotype, on average, have the least severe clinical course, while those with the CAR/Bantu haplotype, on average, have the most severe disease. People with the Benin haplotype usually have disease of intermediate severity (Powars et al , 1994). Sickle cell disease in India and the Persian Gulf region apparently follows a more benign course than it does in Africa and the Americas. The cause of the discrepancy in clinical manifestations is not clear. Leg ulcers are uncommon in India, for instance. In contrast, this complication is frequent in Africa and the Americas (Koshy, et al., Blood 1989). Priapism, which is a debilitating problem for many patients in the Americas, likewise is uncommon in India. In contrast, splenomegaly is common in patients with sickle cell disease in India, while the spleens of most patients in the Americas are small and poorly functional (due to recurrent splenic infarctions). Endemic malaria in much of the Indian subcontinent may account for the splenomegaly. This view is mere supposition, however. Figure 2. Sickle Hemoglobin Haplotype Distribution in Africa. The three major ßs-globin haplotypes found in Africa are shown. The distributions represent the highest concentrations. The genes are expressed at lower frequency outside the highlighted zones. Unfortunately, the dearth of data on sickle cell disease in India allows nothing more than educated guesses. Although the mutation is identical in the sixth position of the ßs-globin in both the African and Asian varieties of the sickle cell disease, the surrounding genetic environment of the two probably differ. The expression of a gene not currently recognized as a modifier of sickle cell disease expression, for instance, could differ between the African and Asian varieties of the condition. If we knew more about these "epigenetic" factors, new treatment strategies for severe sickle cell disease might become apparent. The existence of identical haplotypes in India and in the Persian Gulf region lacks an obvious explanation. Sickle cell disease in India exists mainly in the tribal populations, who to this day remain relatively isolated from the country's mainstream society. The likelihood is low that an influx of a sickle cell gene from outside India occurred to a degree to account for rates of heterozygosity that reach 35% in some tribes. Although current information precludes a conclusive answer, gene flow from from India to the Persia Gulf area through commerce and migration seems the more likely scenario. Interestingly, there are small pockets of sickle genes of the African haplotypes in regions along India's western coast. Sickle cell disease here exists in the decendants of African peoples who came to India during the Moghul period, often as "praetorian" guards for Indian princes. Figure 3. Sickle Hemoglobin Haplotype Distribution in the Middle East and India. The ßs-globin haplotype found in the Middle East and India are shown. The haplotypes are identical in the two areas. The gene probably originated in India and was carried to the Persian Gulf area by trade and migration. This point is unproven, however. The mechanism by which haplotypes influence sickle cell disease severity remains a mystery. Individual haplotypes have varying levels of fetal hemoglobin. Patients with the Senegal haplotype often preserve fetal hemoglobin levels of 20% or more. In contrast, patients with the Bantu/Car haplotype generally express the lowest fetal hemoglobin levels. The Benin haplotype is associated with intermediate fetal hemoglobin levels (Powars and Hiti, 1994). Most people native to an area indigenous for a particular haplotype are homozygous for that haplotype. In the Americas, mixing among slave populations left most patients with sickle cell disease heterozygous for the two of the three common haplotypes (Nagel et al, 1991) . Several investigators have examined the effect of heterozygous sickle haplotype on clinical severity. Nagel et al. (1991) found that the presence of one Senegal haplotype still results in high fetal hemoglobin levels, higher overall hemoglobin levels, lower reticulocyte counts and lower bilirubin levels. In general, patients with at least one Senegal haplotype had milder disease than those who had none. In a study conducted by Steinburg et al. (1995), Benin/CAR heterozygotes trended toward lower fetal hemoglobin levels as well as greater disease severity, while Senegal/CAR haplotypes tended toward intermediate characteristics with respect to fetal hemoglobin level and disease severity (this observation was made by Nagel et al. as well). In addition to haplotype, Steinberg et al. examined the effect of at gender in patients with sickle cell disease. Females tended to have higher levels of fetal hemoglobin than did males, irrespective of haplotype. The investigators suggested that the higher level of fetal hemoglobin could reflect hormonal factors that interact with a haplotype-specific DNA gene regulatory region. Another possibility is a relative peristence of HbF related to genes located on the X chromosome. Further insight into this phenomena possibly could be gained by examining post-menopausal patients with sickle cell disease in whom hormonal patterns differ from those of younger women. Although the mechanism by which haplotype is coupled to disease severity is unknown, a correlation clearly exists. Fetal hemoglobin levels vary generally by haplotype. A correlation appears also to exist between between gender, haplotype and HbF levels. This is a relatively new area of investigation with respect to the variability in sickle cell disease and has not been as fully characterized as alpha-thalassemia and fetal hemoglobin effects. Further investigation could shed additional light on the interplay of haplotypes and disease severity. Understanding the parameters that modify sickle cell disease severity would be enormously useful in treatment decisions. For example,hydroxyurea is a pharmacological agent that raises fetal hemoglobin levels and is used to treat some patients with sickle cell disease. While no adverse effect has been noted in short-term studies (Charache, et. al., 1995), the possibility of long-term complications remains. A method to identify patients with prognoses for severe disease would allow targeted use of the drug for people who stand most to benefit. The need for disease severity prognosis factors is even greater when bone marrow transplantation is considered as a treatment. Bone marrow transplantation can cure patients with sickle cell disease (Walters et al., 1996). Transplantation, however, carries significant intrinsic risks, including death. Reliable selection criteria for patients most likely to benefit would make transplantation a more attractive treatment alternative for many patients. Fetal hemoglobin level is constant throughout life (after stabilization during infancy) and is a relatively good predictor of disease severity. Its ability to augur future clinical course is insufficiently fine, however, for use as the sole arbiter for high risk treatments such as bone marrow transplantation. Concurrent alpha thalassemia also provides some prognostic information about sickle cell disease severity. Alpha thalassemia is a less powerful predictor than is hemoglobin F level, however. Treatment decisions for individuals cannot be made on the basis of this parameter. Haplotypes provide useful population data. Haplotype analysis has been used by anthropologists to trace the migration of African sickle cell genes into the Mediterranean basin. As a predictor of disease severity, however, haplotype analysis is far tos crude for clinical utility. Multivariant analysis has been used to enhance the predictive value of independent parameters of disease. By combining several weak predictors, a more compelling set of forecast data often can be generated. The interrelationship between fetal hemoglobin levels and haplotype means that these may not be independent variables in considerations of disease severity. Therefore, multivariant analysis may be of limited utility. With rare exception, clinical prediction in medicine is at best a chancy matter. In sickle cell disease, the point was made dramatically by Amin et al (1991) who examined many parameters in a monozygotic twin pair living in the same environment. The sickle cell disease severity was strikingly different in the children. No measured parameter differed between the two, however. We must continue to explore the biological basis of sickle cell disease and its severity. We must at the same time remember that we only scratch the surface of nature's complexity. Acquaye, JK; Omer, A; Ganeshaguru, K; Sejeny, SA; Hoffbrand, AV. 1985. Non-benign sickle cell anaemia in western Saudi Arabia. Br. J. Haematol. 60: 99-108. Adekile AD, Kitundu MN, Gu LH, Lanclos KD, Adeodu OO, Huisman TH. 1992. Haplotypes in SS patients from Nigeria; characterization of one atypical beta S haplotype no. 19 (Benin) associated with elevated HB F and high G gamma levels. Ann Hematol 65:41-45. Amin, et al. 1991. Monozygotic twins with sickle cell anemia and discordant clinical courses: clinical and laboratory studies. Hemoglobin 15:247-256. Bailey, K; Morris, JS; Thomas, P; Serjeant, GR. 1992. Fetal haemoglobin and early manifestations of homozygous sickle cell disease. Arch. Dis. Child. 67:517-20. Ballas, SK, et. al. 1988. Rheologic predictors of the severity of the painful sickle cell crisis. Blood 72: 1216-1223. Ballas, SK. 1991. Sickle cell anemia with few painful crises is characterized by decreased red cell deformability and increased number ofdense cells. Am. J. Hematol. 36: 122-30. Bunn, HF; Forget, BG: Hemoglobin: Molecular, Genetic, and Clinical Aspects. Philadelphia: WB Saunders, 1986. Carlson J, Nash GB, Gabutti V, al-Yaman F, Wahlgren M. 1994. Natural protection against severe Plasmodium falciparum malaria due to impaired rosette formation. Blood 84:3909-3814. Charache, et. al. 1995. Effect of hydroxyurea on the frequency of painful crises in sickle cell anemia. Investigators of the Multicenter Study of Hydroxyurea in Sickle Cell Anemia. N Engl J Med 332:1317-22. Eaton W., Hofrichter J, 1995. The biophysics of sickle cell hydroxyurea therapy. Science 268:1142-1143.
el-Hazmi, MA. 1992. Heterogeneity and variation of clinical and haematological expression of haemoglobin S in Saudi Arabs. Acta Haematol. 88: 67-71. Economou, EP; Antonarakis, SE; Kazazian Jr, HH; Serjeant, GR; Dover, GJ. 1991. Variation in hemoglobin F production among normal and sickle cell adults is not related to nucleotide substitutions in the gamma promoter regions. Blood 77: 174-177. Embury, SH, et. al. 1982. Concurrent sickle-cell anemia and alpha-thalassemia: effect on severity of anemia. N. Engl. J. Med. 306: 270-274. Embury, SH, et al. 1984. Concurrent sickle cell anemia and alpha-thalassemia. Effect on pathological properties of sickle erythrocytes. J. Clin. Invest. 116-123. Emond, AM; Holman, R; Hayes, RJ; Serjeant, GR. 1980. Priapism and impotence in homozygous sickle cell disease. Arch. Int. Med. 140: 1434-7. Fabry ME, Fine E, Rajanayagam V, Factor SM, Gore J, Sylla M, Nagel RL. 1992. Demonstration of endothelial adhesion of sickle cells in vivo: a distinct role for deformable sickle cell discocytes. Blood 79: 1602-1611. Goldberg M, Husson M, Bunn H: 1977. The participation of hemoglobins A and F in the polymerization of sickle hemoglobin. J. Biol. Chemistry 252:3414-3421. Hattori Y, Kutlar F, Kutlar A,McKie, VC, Huisman THJ. 1986. Haplotypes of ßs chromosomes among patients with sickle cell anemia from Georgia. Hemoglobin 10: 623-642. Ingram, VM 1956. A specific chemical difference between the globins of normal human and sickle cell anemia hemoglobin. Nature 178:792. Kar, B; Satapathy, RK; Kulozik, AE; Kulozik, M; Sirr, S; Serjeant, BE; Serjeant, GR 1986. Sickle cell disease in Orissa State, India. Lancet 2: 1198-201. Koshy, M; Entsuah, R; Koranda, A; Kraus, AP; Johnson, R; Bellvue, R; Flournoy-Gill, Z; Levy, P. 1989. Leg ulcers in patients with sickle cell disease. Blood 74: 1403-8. Nagel, RL, et. al. 1991. The Senegal DNA haplotype is associated with the amelioration of anemia in African-American sickle cell anemia patients. Blood 77: 1371-1375. Perrine, RP; Pembrey, ME; John, P; Perrine, S; Shoup, F. 1978. Natural history of sickle cell anemia in Saudi Arabs. A study of 270 subjects. Annals of Int. Med. 88: 1-6. Platt, OS; Brambilla, DJ; Rosse, WF; Milner, PF; Castro, O; Steinberg, MH; Klug, PP. 1994. Mortality in sickle cell disease. Life expectancy and risk factors for early death. N. Engl. J. Med 330: 1639-44. Powars, D, et al. 1993. Sickle cell anemia. Beta s gene cluster haplotypes as genetic markers for severe disease expression. Am. J. Dis. Child. 147:1197-1202. Powars, D, et. al. 1994. Beta-S gene cluster haplotypes modulate hematologic and hemorheologic expression in sickle cell anemia. Use in predicting clinical severity. Am. J. Ped. Hematology-Oncology 16:55-61. Schechter, AN; Bunn HF 1982. What determines severity in sickle cell disease? (Editorial) N Engl J Med. 306:295. Seltzer, WK; Abshire, TC; Lane, PA; Roloff, JS; Githens, JH. 1992. Molecular genetic studies in black families with sickle cell anemia and unusually high levels of fetal hemoglobin. Hemoglobin 16: 363-77. Steinberg, MH; Embury, SH. 1986. Alpha-thalassemia in blacks: genetic and clinical aspects and interactions with the sickle hemoglobin gene. Blood 68:985. Walters MC, Patience M, Leisenring W, Eckman JR, Scott JP, Mentzer WC, Davies SC, Ohene-Frempong K, Bernaudin F, Matthews DC, Storb R, Sullivan KM. 1996. Bone marrow transplantation for sickle cell disease. N Engl J Med 335: 369-376.